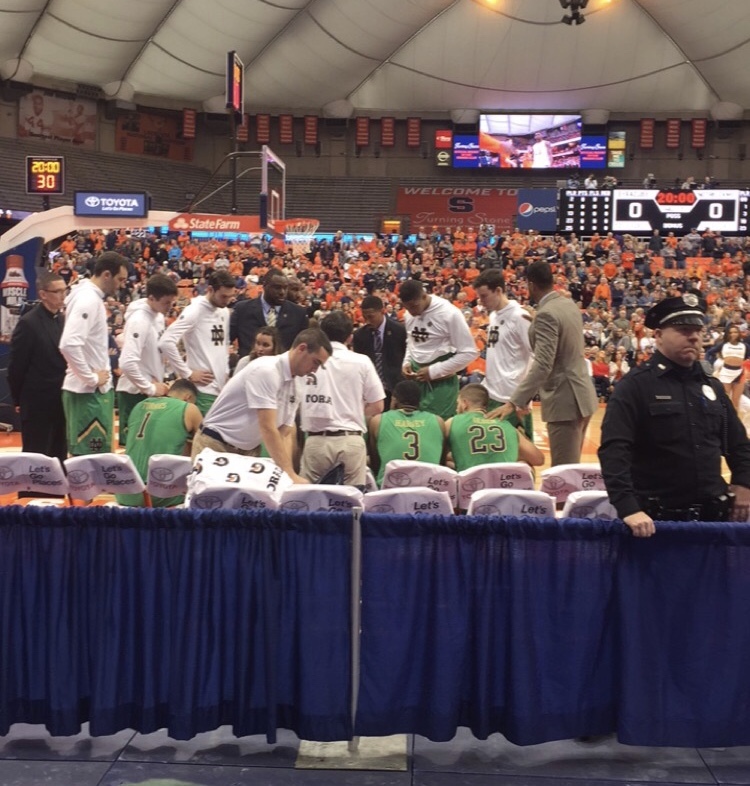 SYRACUSE, N.Y. – The Syracuse men’s basketball team fell to Notre Dame 51-49 on Saturday afternoon in front of 24,304 people at the Carrier Dome. With the loss, Syracuse falls to 1-2 in the ACC and 12-4 overall. Notre Dame improves to 3-0 in the conference and 13-3 overall. This was the fewest points that Syracuse scored against Notre Dame since 1942. Despite Tyus Battle scoring 21 points and Oshae Brissett dropping his 8th double-double of the season with 10 points and 11 rebounds, Syracuse managed to only shoot 39% from the field. This comes after Syracuse shot 50% in the first half. On the other end, Notre Dame’s TJ Gibbs scored 18 points, even though Notre Dame shot 30% from the field. Notre Dame, down by nine points at halftime, cut it to within a single point after opening up the second half with an 8-0 run. The Irish also out rebounded the Orange 42-27, which led to second chance points for Notre Dame. This was the second straight game that Syracuse blew a halftime lead and was outrebounded. Notre Dame took a three-point lead with 58 seconds left in the game when Tyus Battle knocked down a three to tie it at 49. After a Notre Dame turnover by Martinas Geben, Tyus Battle had all 24,304 people in the Carrier Dome on their feet with 32 seconds left. An off-the-mark pass by Battle, led to a breakaway for the Irish with 5 seconds left. TJ Gibbs took it to the rim, but was off the mark. Notre Dame’s Rex Pflueger was there to tip it in with two seconds left and that would seal the deal for the Irish. Notre Dame Head Coach Mike Brey was overjoyed with the media after the game. On January 2nd, Notre Dame announced that they would be without their senior forward and captain Bonzie Colson. Colson, the Pre-Season ACC All-American, suffered a broken foot in practice that led to having surgery on January 4th. Colson is expected to be out eight weeks. His injury was announced the day before Notre Dame’s game vs. NC State on January 3rd. In the middle of the second half vs. NC State, Notre Dame’s senior point guard, Matt Farrell, went down hard while going up for a layup. The team announced it was a sprained ankle and would be without Farrell until their game at Georgia Tech on January 10th. The Syracuse Orange (12-4, 1-2) travel to #8 Virginia on Tuesday January 9th and then to #24 Florida State on Saturday January 13th. The Orange will be back in the Carrier Dome to face Pitt on Tuesday January 16th. Notre Dame (13-3, 3-0) travels to Atlanta on Wednesday January 10th to take on Georgia Tech. The Irish play host to #12 North Carolina on Saturday January 13th.